Employee volunteering is a brilliant way for businesses to have social impact, but it can feel like the domain of big corporates, so how can SMEs get involved? What kinds of support are smaller businesses well-placed to provide? In this article for Heart of the City Natalie shares three tips for SMEs. 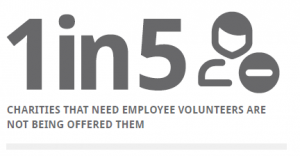 As our recent research showed, there is enormous demand amongst charities for employee volunteers, and plenty of opportunities for businesses to provide more of them. Releasing employees for volunteering can feel like a big commitment for smaller businesses, but for those that get it right,there are many benefits (such as skills development for volunteers). In this article, written for Heart of the City, Three Hands Senior Manager Natalie highlights some of the ways in which SMEs can achieve high impact with their employee volunteering – both for charity partners, and for their business.